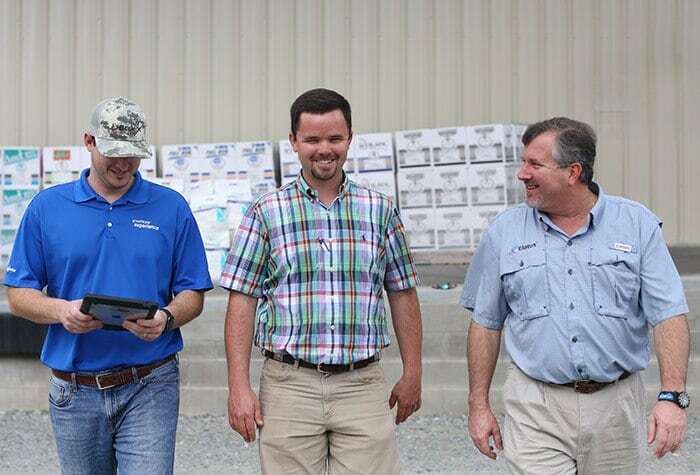 Left to right: Ricky Sloan with Helena Agri-Enterprises, LLC, Syngenta Sales Rep Brent Harbour, grower Clay Sellers and Syngenta AgriEdge Specialist Max DeMott work together to help Sellers produce healthy peanuts on his farm in Hartsfield, Georgia. Clay Sellers never underestimates the importance of controlling fungal diseases in his fields. He also demands results and sticks with solutions that work. Fortunately, Sellers’ crop consultant, Bubba Lambreth, recommended Elatus® fungicide from Syngenta, which is designed for peanut and potato production, for the 2016 growing season. The product contains Solatenol®, a powerful succinate dehydrogenase inhibitor (SDHI) fungicide. It also offers two modes of action and excellent rainfastness for broader, more consistent disease control. This all sounded promising to Sellers, who tried Elatus on a portion of his acres that year. With its long-lasting residual control, Elatus offered such a vast improvement that Sellers had no reservations using the fungicide again in 2017. “We went whole hog with it, because it protects your yield, which helps you make a profit,” he says. Corn trials from 2016 and 2017 across the country continued to support these results. When Trivapro was applied at the critical R1 growth stage, it produced an 18.5-bushel-per-acre increase, on average, compared with untreated acres*. Overall, 79 percent of field trials showed a positive return on investment for acres treated with Trivapro. Trivapro controls gray leaf spot, northern corn leaf blight, southern rust, common rust, northern corn leaf spot, southern corn leaf spot, anthracnose leaf blight, eye spot and a host of other fungal diseases. “Trivapro contains three active ingredients that all provide broad-spectrum control of many diseases and improve plant health,” Tedford says. Along with a strobilurin (a preventive fungicide) and a triazole (a curative fungicide that shuts down existing fungal lesions and keeps them from spreading), Trivapro includes Solatenol, which took 15 years and millions of dollars of research to bring to market. While Solatenol is part of the carboxamide fungicide family, which first debuted decades ago, Syngenta researchers found new ways to optimize this existing chemistry for longer-lasting, more powerful control. Solatenol in Trivapro is 10 times more potent than the next most effective SDHI fungicide available today, Tedford notes. Solatenol has a strong affinity to the receptor site of the pathogen, which translates into higher potency and disease control. Solatenol kills the fungus by inhibiting respiration. “It essentially starves the fungus,” says James Hadden, Ph.D., technical product lead for fungicides at Syngenta. Left to right: Syngenta AgriEdge Specialist Max DeMott, Georgia peanut grower Clay Sellers and Syngenta Sales Rep Brent Harbour make sure Sellers has the right crop inputs lined up for the 2018 growing season. Harbour (left) holds a bag of Elatus fungicide and discusses its value in controlling white mold with Sellers (right). Left to right: Ricky Sloan with Helena Agri-Enterprises, LLC, Harbour, DeMott and Sellers work together to help Sellers produce healthy peanuts on his farm in Hartsfield, Georgia. Sellers uses his laptop to access information online and maintain records to document his farm purchases. A cornfield on Bryan Gover’s farm in Stanford, Kentucky, awaits new spring plantings that will replace the stubble and stalks from 2017. Gover (left) and Matthew Wells (right), his Syngenta rep, check out an ear of corn left over from the 2017 season. Gover relies on Trivapro fungicide to help keep his cornfields healthy. Solatenol also has an affinity for the waxy lipid layer (cuticle) on plant leaves. This prevents the fungicide from being metabolized rapidly, allowing Trivapro to work harder and longer. “It doesn’t punch out early like the competition,” Eury says. This resonates with Bryan Gover, a corn grower from Stanford, Kentucky. When southern rust was prevalent in his area in 2016, Trivapro delivered a 20-bushel yield advantage. It also helped protect stalk strength. Consistent results from modern SDHI mode of action fungicides like Trivapro and Elatus equate to confidence at many levels. “Long-lasting residual control offers growers peace of mind, even under heavy disease pressure,” Hadden says. *Based on 138 non-replicated trials in the U.S in 2016-2017.